Thomas Pickstock III was a merchant and magistrate in British Honduras in the early 1800s. His ancestors were highly respectable, as he descended from an old family in England, the possessors of Pickstock’s Township. Hi father, Thomas Pickstock, was a renowned 18th century privateer, who was the son of Thomas Pickstock, a sergeant in the 99th Regiment. ​Thomas Pickstock served in the Commissary Department of the British Army, in Corsica, Sicily, Italy and the Spanish Peninsula during the Napoleonic Wars. After Napoleon was sent to Elba, Pickstock set up as a merchant in Italy, then traveled through Italy after his business failed. When Napoleon was defeated, Pickstock traveled through France on his way home to England. He left England in 1816 to sell British imports in Belize and in 1823, traveled through Guatemala, during a time of political unrest, to investigate commercial prospects. After deciding to return to England in 1829, Pickstock traveled through the United States and Canada. He died January 25, 1864 in Wharton. 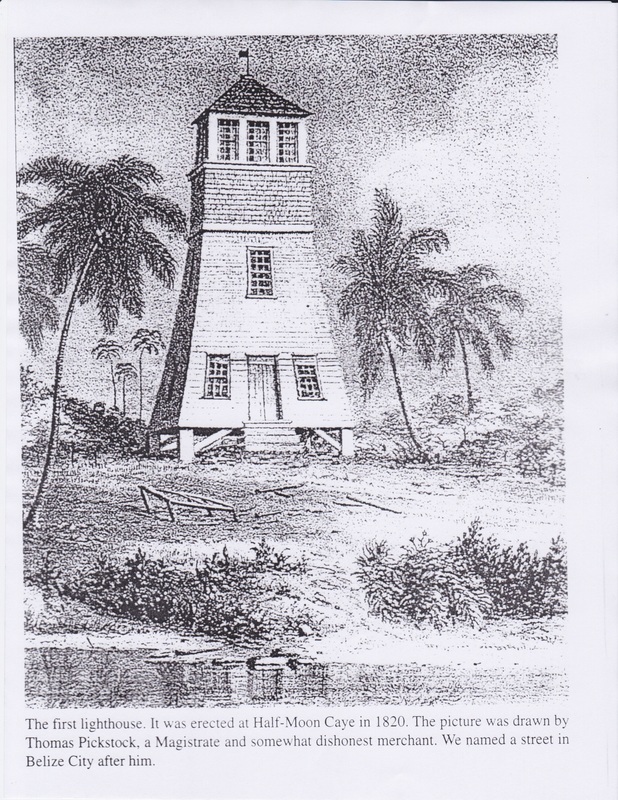 Thomas Pickstock was also an artist and was credited with drawing the first lighthouse erected on Half Moon Caye in 1820 which appears in Emory Kings History of Belize Volume II. A street in Belize City also bears his name. I've read much of what Emory has written. He has a casual, highly readable style. He's funny as hell. 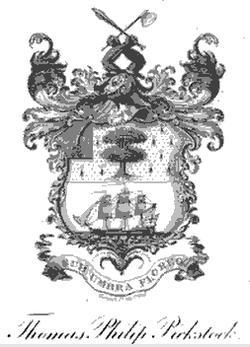 Thomas Pickstock's Coat of Arms has elements of the modern badge in the Belize flag including logging tools, a tree, a sailing ship and the motto Sub Umbra Floreo. The Coat of Arms of Thomas Pickstock was found inside his copy of the Honduras Almanack​ which is accessible online. 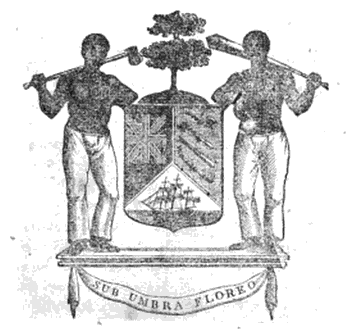 The logo used by the Honduras Gazette, which was published between 1826-1827, was displayed on the cover page and is centered in the header of each issue and includes two men, a tree, ships, and logging tools.